While some might feel ready to flee the cold this time of year, others want to embrace it. Here are some truly beautiful places that become even more stunning once winter rolls around. This quaint ski town is perfect when you really want to get away from it all. With bustling shops and a ski resort situated on Big Mountain, there’s plenty to do and see. At the right vantage point, you can enjoy some scenic views of the mountain reflected in their state lake. But the real pull is their annual winter festival, which features the lesser-known sport of joring. In it, a horse and rider pull a skier along an 800-foot-long horseshoe-shaped course while the skier pulls off jumps and swerves around slalom gates. Lake Tahoe is beautiful year-round, but its gorgeous landscape really peaks in the winter. Besides offering over a dozen ski resorts, the city also has hot springs, beautiful vistas, and a vibrant night life. Visitors can enjoy skiing, nature hikes, and bird-watching, among other wintery activities. Lake Tahoe gets about 125 inches of snow a year, so if all else fails, you can always consider making a snowman. You can find the Gullfoss waterfall in southwest Iceland in the canyon of the Hvítá river, which is fed by Langjökull, the second largest glacier in Iceland. While beautiful in the summer, it’s even more impressive when it partly freezes over in the wintertime. The waters turn vibrant shades of blue and turquoise, while the rocks gather ice and snow. The water falls about 100 feet down in two stages and is surrounded by nearly 200 feet of canyon wall. While there’s not much else to do in the area besides gawk at the waterfalls, most visitors find that it’s well worth the trip to revel in the untouched natural beauty. Situated between the 74th and the 81st parallel, you can’t get much higher than this little mining town. It’s one of the northernmost inhabited areas in the world, making it a prime location to catch the Northern Lights. Because of its location, the town also experiences something called Polar Night, which takes places between mid-November and the end of January: the sun never rises during this time and the lightest the sky gets is a bright blue twilight. This lack of sunlight only increases your chances of spotting the aurora borealis. Even if you don’t catch it (it’s notoriously difficult to predict when it will occur), between the large mountains nearby and the polar bears that inhabit the surrounding area, there’s still plenty to see. This picturesque body of water can be found in the Julian Alps in northwestern Slovenia. The lake surrounds Bled Island, which houses several buildings, including a church that hosts a good number of weddings each year. In fact, it’s considered good luck for the groom to carry his wife up the 99 steps of the church’s tower to ring the bell at the top. During winter, the lake turns a frosty blue and reflects the surrounding snowy mountains on its surface. Visitors to the area can enjoy skiing, or visit the nearby Vintgar gorge, which is home to many waterfalls, pools, and caves. Mammoth Cave is the longest known cave system in the world. Situated in the heart of Kentucky, the intricate system serves as a warm refuge as the ground above begins to freeze. The park offers a variety of tours through the caves, and tourism slows down in the winter, which means you can get a look at this geologic wonder in a group much smaller than the one you’d be stuck with the rest of the year. Going to Russia in the winter is generally ill-advised. But some might be tempted to risk it just to enjoy the views of Lake Baikal, known as the “Sacred Sea” by the native peoples who inhabited the region. The word’s deepest freshwater lake is certainly an attraction any time of year, but in the winter, the body of water becomes a 12,200-square-mile ice rink. Dog-sled and snowmobiling tours are on offer, as are ice diving and rafting in the areas where the water hasn’t frozen over. Located in Joshinetsu Kogen National Park, the Jigokudani Monkey Park gets heavy snowfall for about four months each year. Despite the cold, there are plenty of hot springs to warm up in. This not a well kept secret, especially if you’re a monkey: Snow monkeys are known to come to the valley in the winter and take a dip during the day. Besides watching monkeys kick back, visitors can also check out the steam vents, which shoot hot steam into the air. The little town located just west of Heber City is a gorgeous place to be in the winter. There’s skiing, horse-drawn sleds, and plenty of gorgeous sights. Thanks to a geo-thermal caldera, there’s even year-round scuba diving in the 90-degree waters. 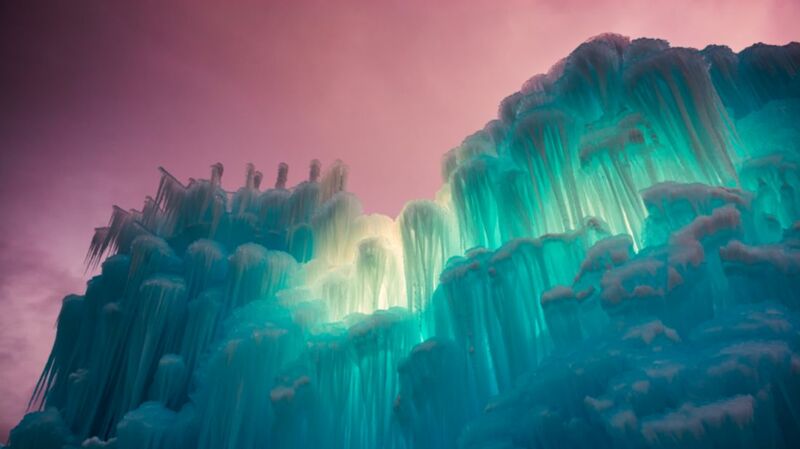 But perhaps the biggest draw are the ice castles built annually by teams of artists. Visitors can explore the massive and intricate structures, constructed using 20 million pounds of ice. From January to February, the chilly Chinese city of Harbin celebrates the season with an ice festival. Guests can wander through (or climb aboard) massive ice structures like castles and slides. There’s also ice skating, dog sledding, lantern art, snow scuptures, and more attractions celebrating all things cold. Ever wanted to touch a glacier? This impressive roadside glacier is just two and a half hours from Anchorage and sits right near the Glenn Highway. There are plenty of pull-offs on the highway to stop and snap pictures, or you can pay a fee to get up close. It’s the largest glacier accessible by car in the United States, stretching over 27 miles long and four miles wide, so it’s definitely worth the detour. Kirkjufell is a mountain that looks straight out of a fairytale. This unusually shaped mountain is pretty enough in the springtime, but becomes truly beautiful once it gets a layer of snow. It’s a favorite subject of nature photographers, but it’s even better when seen in real life. When you’re done, you can visit Grundarfjörður, a small town with a population of just 900 people. This glacier is a popular tourist spot and with good reason. Located in the Los Glaciares National Park, it’s one of only three Patagonian glaciers that is currently growing. The large glacier is three miles wide and goes about 558 feet under water. At the northern end of the giant block of ice, there’s a glacier cave that tourists can explore. Some opt to take boat tours in order to get a good look at its deep blue ice. This mountain is a favorite for skiing and other winter sports. Visitors can take the Olympos Teleferik, a cable car ride that offers breathtaking views of the mountain and seashore. Each car can fit about 80 people, and features panoramic windows allowing guests to get a 360-degree view of the land below. Abisko is home to Nordic wildlife (read: lots of reindeer! ), a vibrant national park, and best of all, frequent appearances of the aurora borealis. Locals and tourists alike enjoy dog sledding, ice fishing, and telemark skiing—traditional downhill skiing using cross-country skis.